DALLAS, TX--(Marketwired - Mar 25, 2015) - The Planet Smoothie franchise plans to open 20 stores within the next three to four years in North Texas, according to Area Developer Blair Ritchey. Ritchey said that he would like to expand the Planet Smoothie franchise into market areas throughout the North Texas area. There are big opportunities, he said, in Flower Mound, Frisco, Garland, Park Cities, Plano and Richardson. "These are good locations for potential franchisees," Ritchey said. "For franchisee candidates who are looking for opportunity, this is a great time to join Planet Smoothie. We have great territories available, which isn't necessarily true for our competitors' brands." Planet Smoothie sets itself apart by offering great-tasting smoothies with real fruit and healthier ingredients. In a side-by-side comparison, its smoothies generally have less sugar and fewer calories -- a big competitive advantage as Americans actively seek healthier options. Demand for healthier dining options has inspired Planet Smoothie to become a big player in North Texas. Planet Smoothie is led by a team of veteran franchise executives who have helped build other iconic brands, including Mail Boxes Etc., and leverages more than 100 years of combined franchising experience to provide support to franchisees. 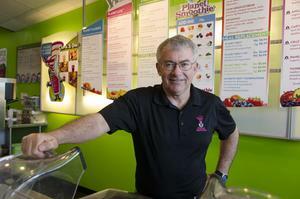 Ritchey got a foothold into the smoothie franchise when he bought his first Planet Smoothie in McKinney, Texas, in 2012. Ritchey brings leadership and entrepreneurial experience to Planet Smoothie that he developed through his decades as a Wesleyan minister who oversaw and planted churches throughout the Dallas area. Now as area developer for North Texas, Ritchey said he would like to gain 20 Dallas smoothie franchise commitments over the next three years. "It's a great brand and a great product," Ritchey said. "It's led by a really effective team, and you can make some money, as well. You can have a store that captures a healthy share of the market. That's an important component of the business. The stores can be structured and positioned to do well and be profitable centers." To learn more, visit www.planetsmoothiefranchise.com/dallas. Blair Ritchey is the North Texas area developer for Planet Smoothie. Planet Smoothie serves products with real fresh fruit and sweetens them with stevia and agave nectar. Planet Smoothie CEO Peter Holt talks about why it's a great time to open a Planet Smoothie.